Bobotie is a South African dish with roots in ancient Rome, according to Wikipedia. The dish Patinam ex lacte consisted of a mixture of cooked meat and pine nuts seasoned with pepper, celery seeds and asafoetida cooked until the flavors were blended, then covered with a top layer of eggs and milk and cooked until the top layer had set. Over the centuries it has evolved into what can be considered one of the national dishes of South Africa. It was the first South African dish that ran across my sphere of being. And I will be eternally grateful that it did, because I loved this dish. I made it for one of my spice group potluck dinners. The featured spice was fenugreek, which is a particularly pungent spice and found mostly in Indian cuisine. I was familiar with the dried leaves, or kasuri/kasoori methi used in Indian cooking but I wanted to find something different. 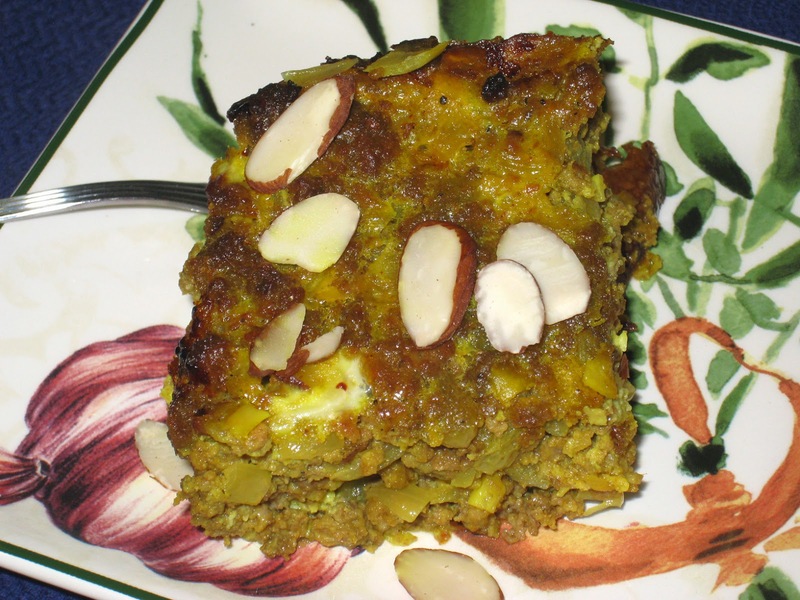 When I found that there are ground fenugreek seeds in Bobotie I decided to try it. It was a big hit; big enough that I have made it a few times since then. While many of the spices are the same as those I use for a more traditional Indian curried dish, the fenugreek and fennel add a unique dimension to the flavor that makes for a nice change. There are several steps to this dish, but they are easy to do and the end result is worth it. If you don't have the individual spices you could use curry powder, but I would recommend that you add the fennel and fenugreek, or at least the fenugreek, to achieve the distinctive flavor that makes this dish so special. Break the tamarind paste into small pieces and place in a small bowl. Cover with half a cup of boiling water and let sit until soft, about 30 minutes. Mash the paste and water together with your fingers until the mixture is smooth. Push the pulp through a fine strainer into a bowl and set aside. Tear the bread into small pieces and place in another small bowl, cover with a fourh of a cup of milk and let sit until the bread soaks up milk. Heat the oil in a large skillet over medium-high heat. Add the lamb and cook, stirring occasionally, until it is well browned and any moisture has evaporated, about 25 minutes. Transfer to a bowl and set aside. Return the skillet to the heat and add the butter. Add the onions and garlic and cook until soft, about 5 minutes. Add the curry powder and sugar and cook until fragrant, about 2 minutes. Place it in the bowl with the lamb mixture, then add the tamarind pulp, the soaked bread, 3 tablespoons os the almonds, the raisins, lemon juice and zest and 1 egg. Season to taste with the salt and pepper and mix well. Place the mixture in a 9" deep-dish pie plate or a 9" x 12" baking dish. Spread the mixture evenly across the bottom. Whisk together the remaining milk and egg and season with salt and pepper. Pour it over the lamb mixture. Place the dish on a rack in the middle of the oven and bake until the custard is set on top and the lamb mixture is heated through, about 30 minutes. Remove from the oven and sprinkle with the remaining almonds. Let cool for 10 minutes before serving.